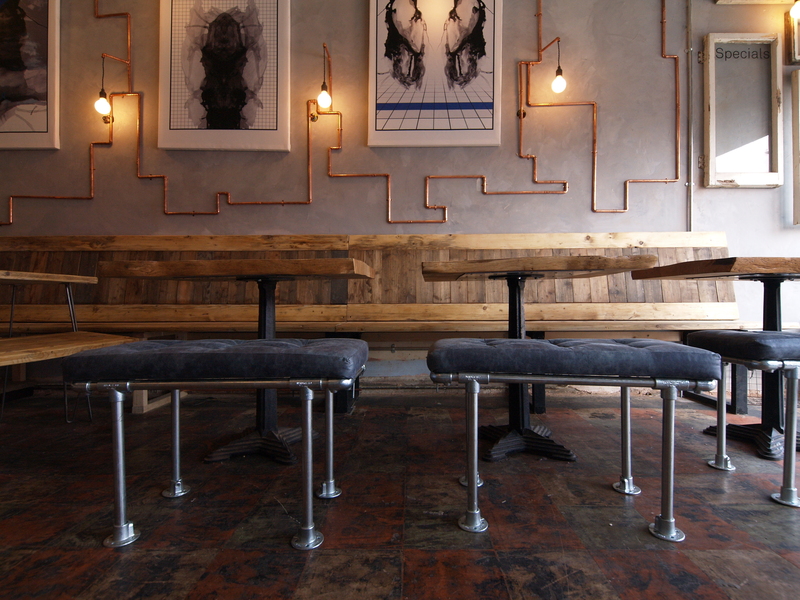 New restaurant and bar Rootdown shares its innovative and imaginative menu with East London. A few weeks ago I celebrated my day of birth by renting out a bar my friend had preached about relentlessly since moving to East London. I arrived at Rootdown early doors in order to greet my guests and sneaked a peak at the food menu – I was so impressed that I came back to try it with my old friend (and new house mate) Rachael. Rootdown may be one of many new restaurants popping up on Lower Clapton Road, but their seasonal menu and unpretentious style ensures it outshines their rivals. Rootdown takes food very seriously. Becca Scales said “Our ingredients are seasonal, locally sourced and largely organic”. Head Chef Ben Lourjane is a champion of vegetables. Their vegetarian dishes are always a hearty and competitive alternative to the meat options. I knew from my birthday party that Rootdown did a cracking cocktail, but my attentions were drawn to the chilli pear caprioska. We were offered a sip and asked if we wanted it hotter; I didn’t. The after tingle on the tongue was enough excitement for me and my sweet tooth. Rachael and I ordered the polenta dish to share which was creamed and accompanied with girolle mushrooms, asparagus, parmesan and truffle oil. I had never eaten creamed polenta before, but I will again after this dish. It had a smooth texture and the other elements of the dish gave depth of flavour. Becca’s description of the crispy skinned pork belly sold it to me, and I wasn’t disappointed. The meat came with a mound of rainbow carrots, shallots, apricot compote and red wine sauce. The salty pork was balanced by sweet vegetables and rich gravy. All elements of this dish were faultless. Rachael and I were both tempted by the vanilla meringue with cream covered with strawberry and elderflower jam, so we shared. This dessert was light, sweet and fluffy. The jam was homemade with locally foraged elderflowers – a complete summer nights dream. The verdict: – The service was unique. Becca’s enthusiasm for Root Down was evident. She made us feel very welcome and described the dishes perfectly. The prices are very reasonable for such great quality food and the portions are generous enough to share plates, in fact I would encourage it. Taste your way through the menu!